Talking about the entire Damier Cobalt collection, GQ magazine said that it comes as â€œa proof you can teach an old print new tricksâ€. Indeed, this Louis Vuitton collection of man bags is just another way the reputed fashion brand reinvents itself. Conceived back in 1888 as a father-son collaboration project, and revealed to the public eye for the first time a year later, together with the worldâ€™s famous landmark – the Eiffel Tower at the Universal Exhibition in Paris, the Damier canvas has been one of the houseâ€™s distinctive features. Now the same checkered canvas that used to cover three chromatic tones (black, charcoal grey, and brown) comes in a new and more modern version: a dark and deep blue, looking more sophisticated than at the moment it was first created. 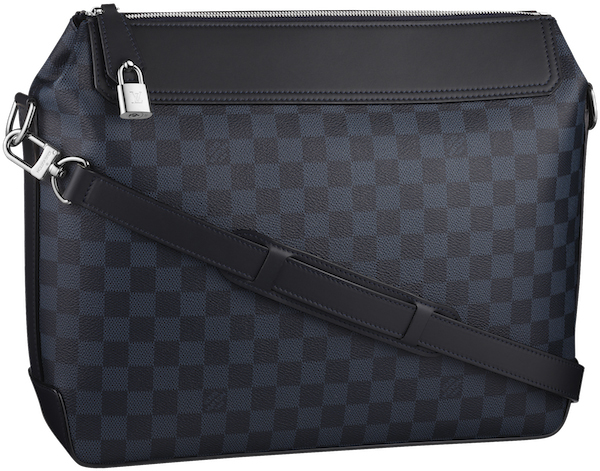 Especially created for busy and dynamic men that need a reliable and classic bag to accompany them on a daily basis, Damier Cobalt Greenwich Messenger is the accessory you were looking for. This bag Â will help you achieve that stylish appearance of male sophistication that you have had in mind for a long time. Easy to carry in your hand or on the shoulder, solid and secured with a lockable zipper, this Louis Vuitton fashion item has all the chances to become next yearâ€™s cold season star fashion item, while the canvas Louis Vuitton and his son Georges came up with has all the chances to be reinvented again and again and to feature the runways of many seasons to come.